A thief stole a chain from a teenager on a tram in south-east London and then tried it on - checking his reflection in the CCTV camera lens, police said. 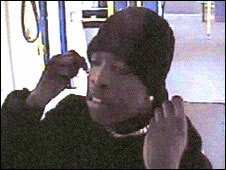 Officers said the suspect snatched the chain and a bracelet from a 16-year-old boy in Bromley on 23 March. The thief threatened to stab the boy, who got on the tram at Elmers End, when he tried to retrieve his jewellery. The images were issued on Wednesday by British Transport Police (BTP) in an effort to track down the thief. Det Con Dan Arundell said: "They were approached by a black male who demanded the victim show him the bracelet he was wearing. "The suspect grabbed the bracelet and then grabbed the chain from his wrist. He then asked if the necklace matched and grabbed that from the victim. "The suspect is then captured on CCTV trying on the necklace and checking himself out in the reflection of the camera." The suspect fled the tram at Woodside tram stop. Anyone with information is asked to contact British Transport Police on 0800 405040 or the Witness Appeal Line on 020 7391 5275, quoting background log B10 of 10/06/08.